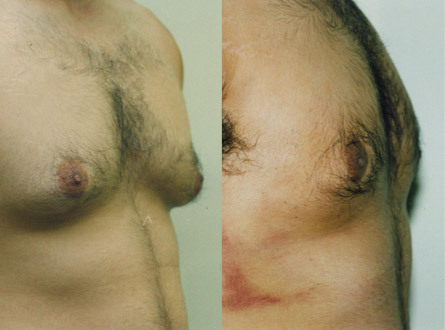 Gynecomastia, or enlarged male breasts, is a condition that affects 40 to 60 percent of the male population. Caused by many factors, gynecomastia can impact a man's self-esteem and make him feel self-conscious. Male breast reduction surgery is designed to remove excess fat and tissue to provide men with the flat, masculine chest that they desire. Male breast reduction surgery is performed using general anesthesia in the privacy and comfort of Dr. Khoury's Office Surgery Center. During the procedure, Dr. Khoury makes a small incision at the edge of the areola, removing excess fat, tissue, and skin. If necessary, liposuction is also performed. Dr. Khoury then closes the incision with fine stitches. After male breast reduction, patients may feel mild to moderate pain, which is managed by medication prescribed by the Dr. Khoury. Stitches are typically removed in a week or two, and patients will wear a compression garment for up to two weeks to aid healing. Patients can generally expect recovery to take about a month.